Bystanders (2008) is a series of extreme close-up portraits re-appropriated from South African newspaper archives. The portraits, taken with my Nokia cellular telephone, are of background characters caught in photographs reporting on historical events in South African history. These marginal bystanders perform as a metaphor for the experience of seeing myself, as a young South African, in the background of a complex national history manifesting itself. 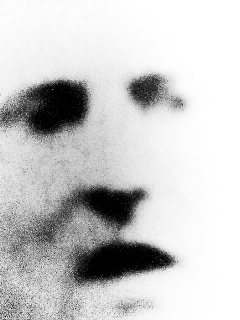 The haunting and lyrical portraits have a momentum mori quality bringing attention to the occasionally violent crop of the camera and the formal pixelated quality of the images, done intentionally as a means of breaking down an image into it smallest form, acts as an annotation of both surveillance and forensic photography. This work was printed onto newsprint and was installed along 7 blocks in St Georges Mall in Cape Town as part of Infecting the City Public Arts Festival Cape Town 2014. The work was made to imitate newspaper poster boards, which put the images that were taken from newspaper archives back into circulation. Wits University Staff Group Show for the WALE (Wits Art and Literature Experience) with Jo Ractliffe, Penny Siopis, Karel Nel, Jeremy Wafer and Robert Hodgins in Johannesburg 2008. Unnatural History as part of the Month of Photography with Inge Prins and Anonia Steyn at the MutiGallery in Cape Town 2008. Group Summer Show at the iArt Gallery with artists Wilma Cruise, Diane Victor, Paul Emsely, Colbert Mashile and William Kentridge in Cape Town 2008. Director Miles Goodall from Suburban Films directed a documentary film called Kool South featuring a group of contemporary South African artists and showcasing Bystanders. Maputo curators meeting organised and funded by the Goethe Institute where the work was presented to curators namely Kwesi Gule, Colette Olof, Simon Njami, Akin Bode, and Bisi Silva. Bisi Silva (The Centre for Contemporary Art Lagos, Nigeria) exhibited the work as part of a show In Light of Play shown at the Durban Art Gallery in 2009 and the Johannesburg Art Fair 2009.